A set of scales like these can be picked up at antiques dealers and fairs for around £50. 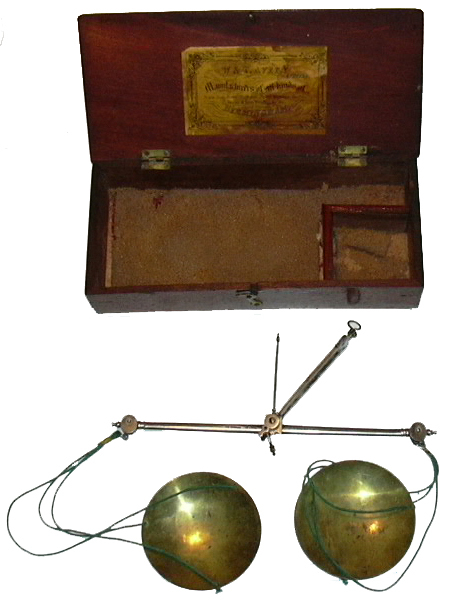 Individual weights, and sets of weights, can often be bought from online auctions such as EBay. Car-boot sales and country auctions often bring forth odd items which have come from a set, or whose purpose has been forgotten. Good auction houses including Stroud Auctions, Sworders and Tennants are now able to offer online catalogues, online bidding and posting abroad (at cost) - see some of our Links if you want to explore beyond EBay! And specialist auctions, some of whom have membership of our Society, offer to dispose of entire collections, some of which are of great importance and interest. These include, for instance, Local Standard balances and weight sets disposed of by UK Weights and Measures Authorities. In October 2017 several East Anglian County Councils auctioned over 100 lots of their surplus equipment, some dating from Victorian days. Metal-detector finds are also of great interest, since their identification and provenance often raise a host of questions. There should also be some marks on the beam itself (this one is marked TO WEIGH 3.OZ and AVERY LTD). With some luck, you might get some weights with it - grains, scruples, drachms and pennyweights etc. would be appropriate for a balance of this size. Sets of weights are sought-after and worthy of study in their own right. Cleaning and restoration of these everyday objects, some of them centuries old, is a specialist field. Many of our members are skilled at this and can offer tips to new collectors. One tip we sometimes offer is not to believe entirely the facts or judgements which sometimes appear on UK television programmes devoted to antiques. For more info please turn to our newsletter Fulcrum and read our Editor's reasoned arguments about scales and other artefacts pronounced upon by so-called experts.